I am so thankful to have met this wonderful couple at a wedding where she was in the bridal party. I was ecstatic to get the call to do photos for them; we have become great friends. I LOVE what I do and the people I meet! What a fantastic engagement shoot! 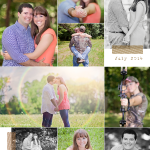 This amazing couple was such a pleasure to work with. We put our ideas together for a session that incorporated all of what we wanted. I can’t wait for the wedding!